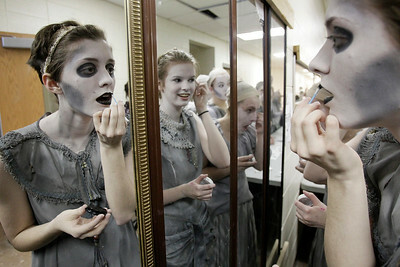 Matthew Apgar - mapgar@shawmedia.com Melanie Vause, left, and Christina Sugrue, center, use mirrors to apply their makeup as they get their ancestor characters into costume backstage prior to the opening show of their musical comedy "The Addams Family" on Thursday, March 03, 2016 at Crystal Lake South High School in Crystal Lake. The show will have additional performances on Friday at 7pm as well as 1pm and 7pm on Saturday. Matthew Apgar - mapgar@shawmedia.com Annie Wuest laughs as Lindsey Meza applies her makeup backstage prior to the opening show of their musical comedy "The Addams Family" on Thursday, March 03, 2016 at Crystal Lake South High School in Crystal Lake. The show will have additional performances on Friday at 7pm as well as 1pm and 7pm on Saturday. Matthew Apgar - mapgar@shawmedia.com Rebekah Otten applies her makeup to get into her character as an ancestor prior to the opening show of their musical comedy "The Addams Family" on Thursday, March 03, 2016 at Crystal Lake South High School in Crystal Lake. The show will have additional performances on Friday at 7pm as well as 1pm and 7pm on Saturday. Matthew Apgar - mapgar@shawmedia.com Beth Gardner, center, helps Kristofer Slimko with his Pugsley makeup as Jessica Santos, back, gets into costume as Grandma backstage prior to the opening show of their musical comedy "The Addams Family" on Thursday, March 03, 2016 at Crystal Lake South High School in Crystal Lake. The show will have additional performances on Friday at 7pm as well as 1pm and 7pm on Saturday. Rebekah Otten applies her makeup to get into her character as an ancestor prior to the opening show of their musical comedy "The Addams Family" on Thursday, March 03, 2016 at Crystal Lake South High School in Crystal Lake. The show will have additional performances on Friday at 7pm as well as 1pm and 7pm on Saturday.